Tuva for NGSS or: How to Bring Today’s Climate Science News Into the Classroom. A few days ago, the World Meteorological Organization (WMO) issued a press release announcing that globally averaged Carbon Dioxide (CO2) levels in the atmosphere have reached the symbolic and significant milestone of 400 parts per million (ppm) for the entire year. The UN agency made a bold prediction, painted a bleak picture if the trend continues, and declared that this marks the start of a new era of climate reality. Did you know that the historical Atmospheric Carbon Dioxide data from the Mauna Loa Observatory is in the Tuva Datasets Library? Tuva’s Atmospheric Carbon Dioxide (1958-2015) (Tuva Premium subscribers only) dataset enables your students to wear the hat of a meteorologist. Students can easily explore, visualize, analyze, and model the atmospheric Carbon Dioxide data from the Mauna Loa observatory, just like the meteorologists at WMO. a. How has the globally averaged CO2 levels increased over the last 50 years? b. When did the average CO2 level first past the 400ppm threshold? c. How does the average CO2 levels vary by seasons, and why? d. If this increasing trend continues, what will be the global average CO2 levels in 2050? Cultivating students’ scientific habits of mind, building their capability to engage in scientific inquiry, and engaging them in practices that reflect those of scientists, researchers, and engineers is one of the primary goals of the Next Generation Science Standards. At this watershed moment in climate science and human history, Tuva enables you to realize this vision with your students. Author Harshil ParikhPosted on October 26, 2016 October 26, 2016 Categories Tuva for Science EducationLeave a comment on Tuva for NGSS or: How to Bring Today’s Climate Science News Into the Classroom. Aside from Ralph Waldo Emerson’s claim (paraphrasing William Butler), of all Earth systems, the atmosphere can be one of the hardest for (non- pig) students to perceive. Although we breathe in atmosphere every minute, its chemistry, layers, air masses, and patterns of movement occur at large scales and are often invisible. We can feel the wind, but how can we discern its large-scale geographical and temporal patterns? Through data, of course! Following up from the release of our first Tuva Science Collection on Earth in Space, today we are excited to introduce Tuva’s second science collection – Atmosphere. The Atmosphere Collection includes datasets and activities that explore differences among vertical layers in the atmosphere, geographic variability in atmospheric pollutants, and temporal changes in components of the atmosphere such as the stratospheric ozone layer. Some of the activities also explore weather and climate data to make sense of how air masses move. The size of the Antarctic ozone hole changes seasonally and is correlated with atmospheric concentrations of CFCs. Atmospheric concentrations of CO2 and other pollutants have increased during recent decades, as has human population. Relationships between different atmospheric parameters can be modeled and predicted mathematically. Air masses can transport pollutants from source areas to distant non-source areas. Human actions to mitigate air pollution can improve air quality. The activities support NGSS performance expectations, such as exploring evidence for how motions and interactions of air masses result in changes in weather conditions (MS-ESS2-5), or analyzing geoscience data to forecast of the rate of change in the ozone hole (HS-ESS3-5). These activities also support a number of CCSS-Math standards such as modeling relationships with linear equations. Don’t forget to give your students opportunity to explore data on their own to make their own discoveries. Help your students learn to “see the wind” — through data! The Earth in Space and Atmosphere collections are available for Tuva Premium Subscribers. Few have conveyed the beauty of dawn with more inspiration than Emily Dickinson. As teachers of Earth science, we aspire to convey to students appreciation and understanding of what it means to be a planet moving through space and how our position and movement in space predictably affects our everyday experience of, well — day! The magnitude of spatial and temporal scale differences covered by the topic of “Earth in Space” makes it challenging to find datasets about stars, planets, Sun and Moon, orbits, seasons, tides, and day-lengths that are of a scope that students can explore to find meaning and discover patterns and relationships. 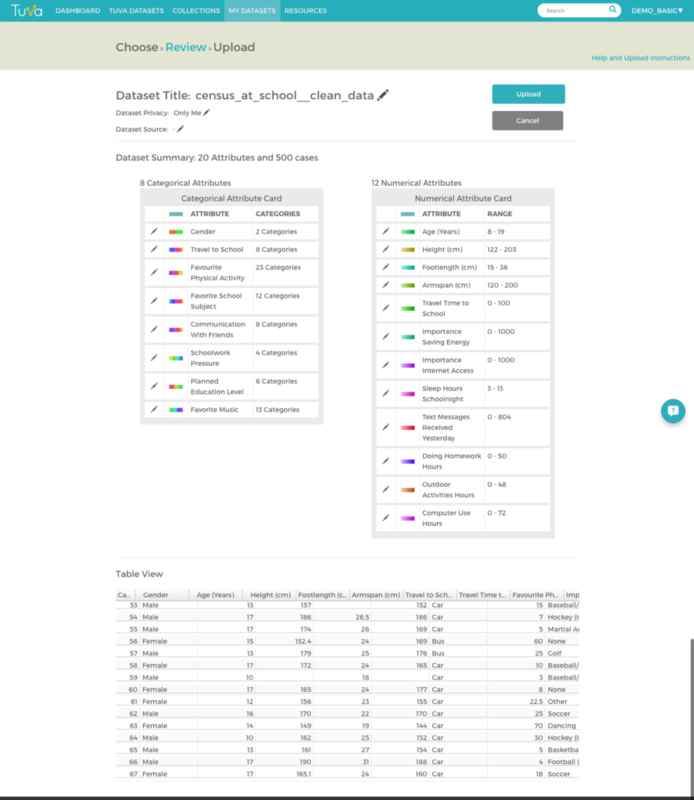 At Tuva, we are gathering datasets into collections by topic to help you quickly find data and activities that support a unit you are teaching. Our first Tuva Science Collection is Earth in Space. Stars range in size, type, and distance from our Solar System. Seasons occur at opposite times of year in northern and southern hemispheres. The timing of tide cycles can be explained (and predicted) by the phase (and position) of the Moon. How much day length changes through the year depends on latitude. Each dataset has at least one activity, and you can add or adapt activities to fit your teaching goals. Help your students discover and appreciate the music of the spheres — through data! We will be adding many other science collections in coming weeks and months. If there is a collection you are especially interested in, please let us know via Tuva Support or share with the community on Tuva Discussions.